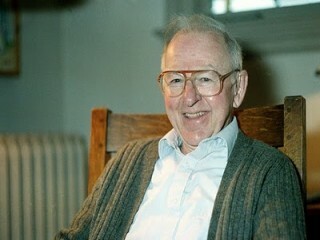 Edwin Gerhard Krebs was born to William Carl Krebs and Louisa Helena StegemanKrebs in Lansing, Iowa, on June 6, 1918. He was the third of four children.His father, a Presbyterian minister, died while Krebs was in his first year of high school. In order to keep Krebs's two older brothers enrolled at the University of Illinois in Urbana, Louisa Krebs moved the family from Greenville, where Edwin Krebs grew up, to the university town. In 1940, after completing his high-school and undergraduate work in Urbana, Krebs entered medical school at Washington University School of Medicine in St. Louis, Missouri. He had the opportunity to work under Arda A. Green, who was associated with Carl Ferdinand Cori and Gerty T. Cori. The Coris were a husband-and-wife team who had won the Nobel Prize in 1947 for research oncarbohydrate metabolism and the enzyme phosphorylase. Krebs's later collaboration with Edmond Fischer at the University of Washington in Seattle had its beginning in the research conducted by the Coris. After receiving his medical degree in 1943 and completing an eight-month residency in internal medicine at Barnes Hospital in St. Louis, Krebs became a medical officer in the navy, serving in that capacity until 1946. Due to the unavailability of a resident position, and on the advice of one of his professors, Krebs began studying science. Because of his background in chemistry, Krebs chose to work in biochemistry and was accepted by the Coris as a postdoctoral fellow in their laboratory. For two years, while working for the Coris, Krebs studied the interaction of protamine (a basic protein) with rabbit muscle phosphorylase. This work seemed so rewarding to him that he decided to continue his efforts in the field of research, and when in 1948 he was invited byHans Neurath to join the faculty as an assistant professor in the departmentof biochemistry at the University of Washington. At this time Neurath's department greatly emphasized protein chemistry and enzymology (enzymes are proteins that act as catalysts in biochemical reactions). Work in the Coris' laboratory had established that the enzyme phosphorylase existed in active and inactive forms, but what controlled its activity wasunknown. Combining his experience on mammalian skeletal muscle phosphorylasewith Edmond Fischer's experience with potato phosphorylase after Fischer joined the department, Krebs and Fischer teamed up to uncover the molecular mechanism by which phosphorylase makes energy available to a contracting muscle. What they discovered was reversible protein phosphorylation. An enzyme calledprotein kinase takes phosphate from adenosine triphosphate (ATP), the supplier of energy to cells, and adds it to inactive phosphorylase, changing the shape of the phosphorylase and consequently switching it on. Another enzyme, called protein phosphatase, reverses this process by removing the phosphate fromphosphorylase, thus deactivating it. Protein kinases are present in all cells. Once it became evident that reversible protein phosphorylation was a generalprocess, the impact of Krebs and Fischer's work was immeasurable. Their collaboration opened the field of biochemical research and paved the way to much of the work done in the area of biotechnology and genetic engineering. Proteinphosphorylation has even been posited as the basis of learning and memory. Medical applications have included development of the drug cyclosporin, whichblocks the body's immune response by interfering with phosphorylation to prevent rejection of transplants. As important as what happens when the process functions normally is what happens when It goes awry: protein kinases are involved in almost 50 percent of cancer-causing oncogenes. Recognition for Krebs's work came through various awards besides the Nobel Prize. In 1988 Krebs and Fischer shared the Passano Award for their research, and Krebs was one of four scientists to share the Lasker Award for Basic Medical Research in 1989. He was co-recipient of the Robert A. Welch Award in Chemistry in 1991, followed by the Nobel Prize in physiology or medicine a year later. Besides concentrating his research on protein phosphorylation, Krebs has investigated signal transduction and carbohydrate metabolism. In 1968 Krebs had left the University of Washington to accept the position offounding chairman of the department of biological chemistry at the University of California in Davis. When he returned to Washington in 1977 he became chairman of the department of pharmacology. From 1977 until 1983, Krebs was associated with the Howard Hughes Medical Institute as well. Krebs was married on March 10, 1945, to Virginia Deedy French, and they havethree children, Sally, Robert, and Martha. View the full website biography of Edwin G. Krebs.